My first trip to the big city of Chicago sans parental units occurred when I was 15 (I lived in the burbs about 45 minutes outside of the city). My slightly older beau (with a car and license) took me to a favorite haunt of the counter culture in the 60’s and 70’s—Old Town. 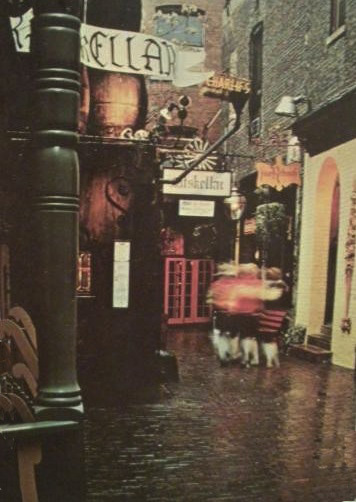 Old Town was Chicago’s answer to NYC’s Greenwich Village. The original Old Town was completely destroyed by the Chicago Fire in 1871 (you know, the Mrs. O'Leary's cow fire). Old Town was quickly rebuilt by its industrious, mostly German-immigrant occupants who had originally settled there in the 1840’s (after white settlers nabbed it from the Indians in the 1830’s). It continued to quietly hum along even after having artists take up residence in the 1930’s. All that changed in the 1960’s when it experienced a cultural transformation and a rush of long-haired youth who came to live and visit and play. 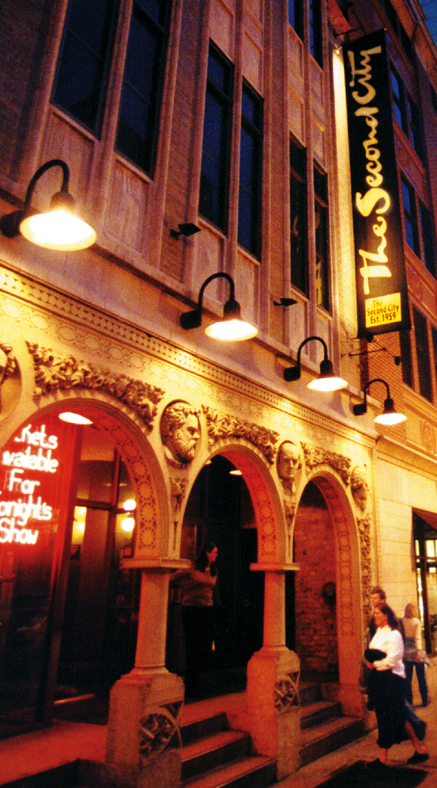 It was the home of great music venues (The Old Town School of Folk Music), quirky shops and of course, the famous Second City theater that was based at Piper’s Alley. With that giant lantern and the carriage lights, it had a magical Diagon Alley kind of atmosphere when I went there long ago. Patchouli wafted around the cobbled street (as a personal statement and in incense form in the shops) but was a sensory distraction from the insanely delicious smell of pizza that issued from a place at the end of the alley –– a place that served the best pizza I had ever had. I still remember it as one of the best. It was called La Piazza Pizza from what I was able to dig up (the name had drained out of my brain years ago, to be honest, I’m not sure I ever knew it as anything other than the ‘pizza place in Piper’s Alley’ … even though everything about the pizza itself was lovingly locked in the old memory box). The space was funky. A lot of brick, cheap faux-Tiffany lights and not very clean as I recall. The pizzas that arrived in pitch black, heavily crusted pans were thick and doughy but with a great depth of flavor in the crust, quite a departure from the cotton-wool bland crusts I was used to. This crust was strong and positively bathed in olive oil –– that’s what made it so damn good –– that and the rich sauce and thick, browned molten cheese. It was a grand, heroic pizza. I found a thread on a website that had many old fans sharing great memories of that pizza so I was not alone in my love of the place –– sadly no pictures of the premises could be found to share with you. I know there are many who praise Pizza Uno or Due or Lou Malnati's, but for me, the best Chicago pizza will always live in that alley. The crust recipe is one I’ve been making since college and is simple as could be. The only change I’ve made is resting it overnight because I think it helps the flavor. I give you a regular size and a mini meatball version as my homage to my favorite pizza. You can make my favorite meatballs or use your own favorite recipe. Also, I like whole wheat in my crust and think it adds character. I doubled down on flavor by using Red Fyfe wheat which is amazing stuff (I got the wheat from Sarah of All Our Fingers in the Pie). If you don't like whole wheat, just use white bread flour. FYI –– traditionally, Chicago pizza is constructed a little differently than most. The mozzarella cheese gets laid down first, then the ingredients, then the sauce is added with Parmesan sprinkled on top and sometimes a drizzling of olive oil. When making the individual pizzas you have to do the mozzarella the old fashioned way, it tops the little pizzas. The extra olive oil is really a triumphant addition if I may say–– related to the Italian fashion of offering herbed olive oil with bread but much better for being baked into the crust. You will fall in love with the technique. One more note, these reheat beautifully and the olive oil keeps them very moist. I also found it was a great idea to dunk them in left-over tomato sauce!! Take the dough out of the fridge and make into rounds, lay in the cupcake molds oiled with the 3 T olive oil –– about a teaspoon per mold. Press the dough to the sides so they are hollowed out. Spread some of the oil over the top of the dough. Let sit for 1 hour. I put oiled 1/2 egg shells in the centers to hold the shape. Preheat oven to 425º for 1/2 an hour with pizza tiles or stones. Bake dough for 15 minutes. Remove from oven and take out the egg shell if you used it, if you didn't pull out enough dough for the meatball to have a seat in the dough. Spoon a bit of herb oil and place a sprinkling of parmesan on the dough. Place a meatball on top with a spoon of tomato sauce (don't use too much sauce, it will sog out the dough) and cover with mozzarella cheese. Ladle a spoon of herb/garlic oil over the top and bake until golden, about 10 -15 minutes more. Combine all the ingredients and knead in a standing mixer or by hand for for 8 minutes. Put in an oiled bowl and cover. Let rise till double in size. Put in the fridge overnight. Take the dough out of the fridge and put in the cupcake molds, oiled with 1 t olive oil. Spread some of the oil over the top of the dough. Let sit for 1 hour. I put 1/2 egg shells in the centers to hold the shape. Preheat oven to 425º for 1/2 an hour with pizza tiles or stones. Bake dough for 15 minutes. Remove from oven and place a sprinkling of parmesan on the dough. Place a meatball on top with a spoon of tomato sauce and cover with mozzarella cheese. Ladle a spoon of herb/garlic oil over the top and bake until golden, about 15 minutes more. Heat 4 tablespoons olive oil in a skillet over medium high heat. When hot, add onions and cook until translucent, 3 to 4 minutes. Add wine, Marsala, bay leaf, 1 teaspoon pepper and 1/2 teaspoon salt. Heat to a boil, then simmer until most of liquid evaporates, 9 to 10 minutes. Discard bay leaf. Transfer to a plate and refrigerate until cold. Gently but thoroughly combine ground beef, chilled onion mixture, egg, bread crumbs, cheese, parsley and chopped basil. Form into meatballs. Cover with plastic wrap and refrigerate up to several hours. Sauté chopped bacon until fat is rendered and bacon crisp and remove. Saute meatballs in the bacon fat and oil until cooked through and remove. Saute the garlic, onion in the oil. Add the tomatoes and oregano and marsala wine and reduce till thick. You can use left-over sauce to dunk the meatball pizzas –– a very tasty treat. Put tiles or stones in the oven and preheat 1/2 an hour to 425º. Swirl olive oil in 9" cake pan. Place the dough inside, working it up the sides. If the dough has been refrigerated, let it warm up in the pan, covered for 1/2 an hour. Bake for 15 minutes and remove. Lay the mozzarella on the pie. Lay on the sausage and then the tomato sauce. Sprinkle with parmesan cheese. Drizzle the herb oil over the top of the pie and brush on the crust. Bake for another 15 minutes or until bubbly. We have much enjoyed this excursion into Chicago's past, a city about which all kinds of different impressions are formed through what we have, over time, read. This post adds yet another dimension and introduces us to the Chicago pizza. All most interesting. Having never been to Chicago I found this post very interesting. I like the sound of the meatballs, something quite different. The pizza also sounds pretty special. I have noted both recipes. Spent a lot of time in Chicago when I was younger...in the 60's. But I do not remember anything about Piper's Alley. (which doesn't necessarily mean I never was there :) ) You have great memories of it. I'm smiling because it DOES resemble Harry Potter's Diagon Alley a bit. But I do know about Chicago pizza. It IS different. I like a crisp crust and their's is bready. That much I do remember. Agree about whole wheat...love it in breads and pasta. So much more flavor as well as being good for us. You've given us some fabulous recipes today, Deana. Love the idea of the pizza balls. Chicago is on my bucket list. I have driven around but have not been to the city. What great ideas with pizza! I have never heard of a meatball pizza and love those little individual ones. I think I might make it with my girls at Kids Cooking Camp next week! Glad you are enjoying the Red Fyfe. What what what? This is a pizza. Wicked cool. They look like muffins. I have never seen anything like this. Sounds incredible. SO, why is everyone this season dreaming of perfect pizza? I think it really is THE quintessential American food, period. I love Chicago deep dish pizza! Inspired by this post I may need to hop on a plane to procure a bonafide Chicago deep dish. I love your description of the pizza you ate, it's a meets the standard of an extraordinary one. These mini versions look delicious! I can't believe I never delved into that part of Chicago having lived only 90 minutes away by freeway all of my life! I guess the thought of driving home after a night of fun was always problematic :) I have to admit I'm partial to thin crust pizzas but I would most certainly try your adorable meatball pizzas. The meatballs alone sound fantastic. I love the look.. of the individuals and the biggi:)Really ?You get your flour from Sarah? Love blogland! We have been to Chicago Pizza..is that the one you mean? Tonight pizza is in the cards here..But Jacques'. I have memories of Old Town and Piper's Alley from the 60's too. Our parents used to take us ...I remember a candy store and eating at Paul Bunyan's. After college I worked at Gullivers on Howard St. great pizza, we served in those blackened pans as you remember well. And the large ones were so heavy! Your individual pizzas sound perfect! La Piazza!!! I loved that place, and our gang of friends were there countless times. I loved this article! I, too, have memmories of going to Old Town in the '60's. Getting pizza at the Piper's Alley pizza shop was my first experience with Chicago-style deep dish pizza. Oh, I think you should check your history. To my knowledge, Old Town is called "Old Town" because it was the only area left standing after the "Chicago Fire." I wish I could contact you to tell you how great your pizza was. Kudos. Did you ever open a new place? We are related! Harry Levin ring a bell? We would love to keep in touch. Don't know a Harry Levin. He was the owner of Piper's alley pizza? Our family still has the recipe. I plan on returning but it will take some time. jeffrey, that is amazing. you have the recipe???? I would love to write about it. So many people have great memories of it. I could not agree with you more about La Piazza. When I was in high school,my friends and I would always go to Pizzeria Uno or Due after the Blackhawk games. One night, a friend suggested we go to La Piazza and I always felt it was the best. The cheese on it was so thick and delicious, I remembered it was almost like chewing bubble gum but I loved it. La Piazza had a certain distinct flavor and I would gladly pay $100 for a couple of their slices. I wish someone could duplicate that recipe! Ur pizza was the best I ever had. The crust was the best part, and I have thought about this pizza for years. I wish to make it, but would luv to have the recipe if it is anywhere to be found. Did u Co tinge to make that fabulous pizza in the 70s? My friends and I went to Old Town for the first time in 1967. I was 16. After walking around in awe of this part of the city went to Pipers' Alley. Ah , what a great place it was. At the end of the Alley was La Piazza Pizza. It was there that experienced my first pan pizza. It was great. Till today I've never had a pan pizza come close to that. Every time I went to old town I had to go to La Piazza. I frequented Old Town until Pipers' had their fire. I went there during the 70's but it was never the same. I miss that part of the city. It was just a cool place to be back then. I still have some things I bought at Maiden Lane and Bizarre Bizarre. I'd do it all over again. This subject (La Piazza) refuses to go away. I'm another old timer with very fond memories of La Piazza. As a suburban kid at UICC, it was my first bold sampling of Chicago-style pizza. It was love at first taste. Yes, later I enjoyed Uno's, Gino's East, Malnati's and others. But I can still remember that first taste of La Piazza. I think the crust had a light crispness without as much oiliness and hard crunch as the other leading pizzas. Without a doubt, it was the best thing I ever ate in an alley. Hey...that's how I remember it...A Brothers Too....I beleive...but I was young. Nobody here remembers them, why? Best deep dish I ever had. I'd dig in so quick I'd almost choke on the cheese it was so melty, thick. 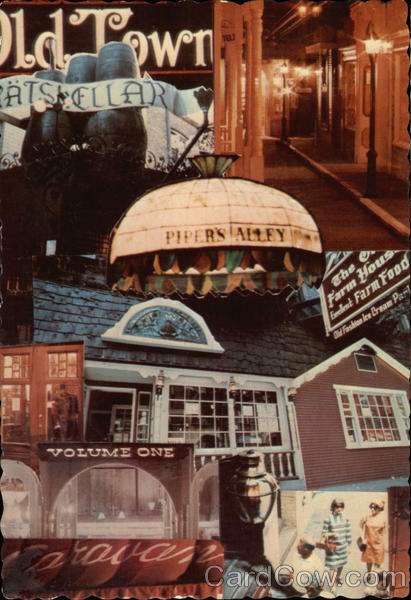 I got to this page by searching "Pizza Pace in Piper's Alley Old Town Chicago. I couldn't remember the name of the pizza place, but I remember that it was the best pizza I ever had. I would come either with my friends or with my boyfriend every weekend! I remember shopping in all the "head shops", buying peace sign jewelry and feather earrings and suede fringe vests, candles, incense and blown glass animals. I wish I would have taken pictures of the place that I spent many a Saturday night enjoying!